Ice has decreased by 71 percent on the Great Lakes over the last 40 years. Photo: Alex Leone. Lake Superior is losing its ice, and quickly. A study published in the Journal of Climate has found that Lake Superior is sporting 79 percent less ice than it did in 1973, and, overall, ice has decreased by 71 percent on the Great Lakes over the last 40 years. The study measured the amount of ice on the lake, and used satellite pictures and Coast Guard observations that were collected over the last four decades for comparison. In 2012, a mere five percent of the lake water froze over. Compare that to 94 percent in 1979 and an average of 40 percent since records were started in 1973. Although there is no smoking gun to indicate why the ice loss is happening, a variety of factors–including a changing global climate–are considered likely causes. Ice loss on Lake Superior can end up contributing to lower lake levels, more lake-effect snow, and higher shoreline erosion rates. The largest and most dramatic result could be an overall increase in lake water temperature. Jay Austin is an associate professor of physics with the UMD’s Large Lakes Observatory, which has conducted research how ice plays into the year-round picture of the lake. Ice causes sunlight to reflect off its surface instead of being transferred as heat into the water. More ice means cooler water temperatures, because more of the sun’s energy is reflected off the lake’s frozen surface. “We are seeing an earlier start of the warm seasons and consequently warmer temperatures throughout the summer,” said Austin. “The temperature is kind of like the master control knob for the lake,” said Austin. 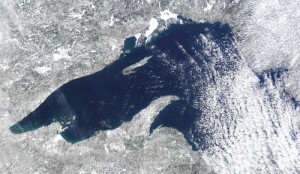 A satellite photo of Lake Superior taken March of 2012 shows very little ice on the lake. Photo: NOAA/ Space Science and Engineering Center, University of Wisconsin-Madison. Everything from weather patterns to nutrient cycles is controlled by the lake’s temperature. Donn Branstrator is an associate professor of biology with the Large Lakes Observatory and studies zooplankton, an intricate part of the biological food chain in the lake. Although the effects of temperature on zooplankton are well documented, it’s still not completely understood exactly how a larger number of these organisms could play out in the lake. This is, in some ways, the biggest challenge the lakes face right now. Although warmer temperatures might offer more favorable conditions to some organisms, others may not be so lucky. Many of the causes and outcomes of ice loss on the lake can only be left up to speculation at this point. The unprecedented change in the lake’s climate in a relatively short time could make it more hospitable to invasive species and could put unforeseen stressors on its natural inhabitants. Austin stressed, however, that the lake is not going to be entirely void of ice anytime soon. Republished with permission of The Statesman. I also agree that scientists seem to feel the need to “tip toe” when it comes to global warming. I guess there is probably a reason for this tip toe, however, as it tends to excite the non-believers a little less. No amount of facts will change the way some folks believe. It takes time for people to come around and accept the changes that are going on around them, and tip toeing may help to accomplish that. But if we must tip toe sometimes, we need to also balance it with firm and consistent statements to support the scientific and obvious facts that our world is changing as we speak, and we’d better be paying attention and responding. I spent my childhood summers at my grandfather’s house on Lake Superior (Ontonagon). I spent many years listening to the stories my Dad told told about growing up on Lake Superior. I heard stories about the ice breakers and freighters getting stuck in ice – ice that would freeze around them so quickly they couldn’t move. I now live within 10 miles of northern Lake MI and the only part that has frozen is a few feet of shoreline. That being said, I also picked up on the same language as Dave: “no smoking gun” and “very gentle trend”. These statements are absurd. Dave suggested “politically driven resistance” and I think he is right on spot. We’ve seen politically driven resistance from the scientific community for a very long time. No one wants to hit the panic button. Society on the whole is standing around doing little or nothing except wringing our collective hands because no one seems to know exactly what to do or where to begin. The issue is huge and Lake Superior is just one symptom in the huge bowl of murky alphabet soup and that soup is getting hotter by the day. I have sailed the upper Great Lakes for decades and have kept a keen eye on these changes in lake temperature and, particularly, the observable decline in ice cover. I can’t imagine that this is some new revelation to the scientific community, as I arrived at the same conclusion about half a decade ago – simply observing the lakes and the historic record from my easy chair. I find it disturbing that actual scientists feel the need to tiptoe around the idea that our climate is warming – measurably and very-rapidly, relative to the geologic time scale. That people of science acknowledge “[t]he unprecedented change in the lake’s climate in a relatively short time” yet also describe it as “a very gentle trend…” is troubling. The fact that these changes are so pronounced within the span of a generation is jumping up and down, screaming at us, but there appears to be a politically-driven resistance to acknowledging it. The claim that there is “no smoking gun” is also misleading. While society will foolishly stand around, wringing its collective hands and search for ways to deny that the climate is warming – or to argue about the human impacts – temperature is the variable that is involved in ice formation. As our climate and the lakes warm, less ice. QED. I hope that the tipping point in the Great Lakes hasn’t been passed, where ice-free winters cause a feedback loop, leading to even greater warming of the lakes’ core temperatures and thus a greater tendency to remain ice-free.